Each team is required to design and build a 300-pound toboggan that includes a steel tube superstructure with concrete skis, can seat five people, and can withstand a crash at 65km per hour from various angles. In addition to the structure requirements, teams have to come up with a theme. 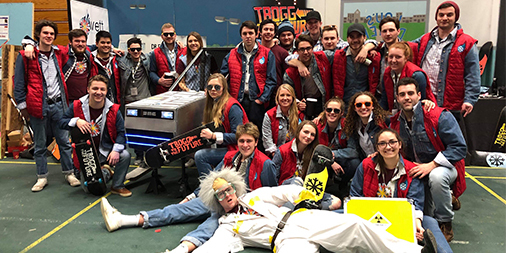 This year, WETT took on a Back to the Future theme, designing their toboggan to replicate the legendary DeLorean. Over the course of the week, teams are judged in numerous categories including concrete mix design, frame design, steering, braking, a technical report, race day speed, and school spirit. Of the 25 teams competing, WETT received 2nd place overall, winning 1st place in concrete mix design and technical presentations, and 3rd place in braking performance and concrete reinforcement.